HomeYouth Question: What is Baptism? Youth Question: What is Baptism? In order to understand what baptism is, it might be helpful to understand where it came from. Jesus didn’t invent baptism but the events of his life, death and resurrection changed it forever. But first, the history: If you’ve ever heard of the Dead Sea Scrolls, you have probably heard of the Essenes, the folks who hid them. The Dead Sea Scrolls are the most ancient copies we have yet discovered of many ancient texts and they tell us a lot about the culture of the people who left them behind. From the scrolls and from archaeology, we know that these people regularly dipped themselves in water, not to remove dirt, but as a form of ritual purification, to become purified in the sight of God before worship or prayer. In the same way, priests and everyday folk would pass through a ritual bath before entering the Temple during the time of the New Testament. The priests often had ritual baths (called Miqveh, pronounced mick-vuh, or mick-vay) in their homes, but ordinary folk could pass through some swimming pool sized baths (men and women were separated, of course) that were just outside of the Temple. John’s baptism built on this cultural idea of ritual purification. People came to John to be baptized as a symbol of their repentance before God. But after the coming of Jesus, something changed. In Acts 19:1-7, Paul and Apollos meet followers of God in Ephesus that had been baptized by John but who had not heard the story of Jesus. Paul said, “John’s baptism was a baptism of repentance. He told the people to believe in the one coming after him, that is, in Jesus.” On hearing this, they were baptized in the name of the Lord Jesus. When Paul placed his hands on them, the Holy Spirit came on them, and they spoke in tongues and prophesied. 7 There were about twelve men in all. Something happens at baptism that is more significant than just ritual or symbolism, and more than just the repentance of the person who is baptized. What happens at baptism is something that God is doing, far more than the people who are participating in the baptism. In our church we say that baptism is a sacrament, one of the two (along with communion) in which God is present and is a participant in the event. We believe that the “thing that happens” at baptism is something that God does. 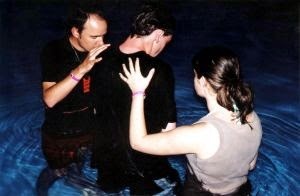 This is why we do not typically “re-baptize” those who have already been baptized. Doing so would be saying that God didn’t do it right the first time. The symbolism of baptism is now more than just repentance, going under the water and coming back up also symbolizes Jesus’ death, burial, and resurrection so that, through baptism, we too are buried and are raised to begin a new life. Peter tells us (1 Peter 3:20-22) that baptism saves us through the resurrection of Jesus, just as the ark saved Noah and his family. In him you were also circumcised with a circumcision not performed by human hands. Your whole self ruled by the flesh was put off when you were circumcised by Christ, having been buried with him in baptism, in which you were also raised with him through your faith in the working of God, who raised him from the dead. In God’s covenant with Israel (the Old Covenant or Old Testament) the symbol of joining and being a part of the covenant was male, infant circumcision. But now, after the life of Jesus and the coming of God’s new covenant (or New Testament), the symbol of belonging is no longer male circumcision, but baptism for all people. For us, baptism is the outward sign that we have put our faith in Jesus Christ and have chosen to belong to God’s people. Next: Why do we Baptize Infants? ← Youth Questions: Why Use Grape Juice Instead of Wine?